PULZAR Z-2 GREASE is a family of lithium-thickened lubricants designed for multi-functional applications in a variety of environments. Formulated to withstand temperatures up to 302°F for extended periods of time, PULZAR Z-2 GREASE uses tough film base oils to provide excellent wear protection, even in heavily loaded applications. Because lithium grease naturally resists water, PULZAR Z-2 GREASE works well in damp environments. PULZAR Z-2 GREASE exhibits excellent mechanical stability under operating conditions and during storage. 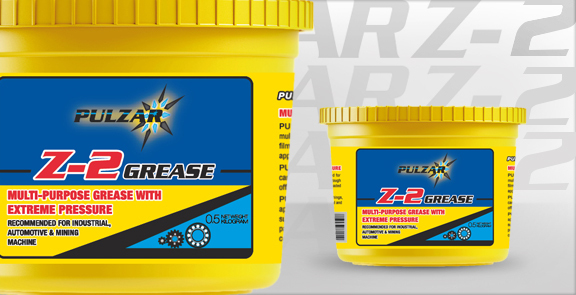 PULZAR Z-2 GREASE is fortified to protect against rust and corrosion. An oxidation inhibitor promotes long-life trouble-free performance. Special extreme pressure additives enhance the load carrying ability of these greases. PULZAR Z-2 GREASE is a heavy duty, extreme pressure grease designed for multifunctional applications in a variety of environment. It contains tough film base oils to provide excellent wear protection even in heavily loaded applications. PULZAR Z-2 GREASE is designed to lubricate ball and roller bearings, bushings, cams, universal joints, pins bars, slides, and other applications in industrial and off-road equipment, such as plastic injection molding machines, paper machines, grinders and machine tools, concrete mixing machinery, etc.